Fig. 8-3. Altitude as a Function of Date for 9 Hypothetical Satellites Launched over a 6-Year Period. The bars at approximately 400 km altitude mark the periods of solar maxima when the F10.7 index was above 150. Figure 8-4 summarizes satellite decay in a convenient manner for mission analysis use. The 3 sets of curves show lifetime as a function of initial circular altitude for satellites with ballistic coefficients that are low (20 kg/m2), moderate (65 kg/m2), and high (200 kg/m2). The spread in the curves near the middle represents the difference between solar maximum (F10.7 = 225) and solar minimum (F10.7 =75). At the left of the figure, below about 200 km, satellite orbits decay within a few days, the atmospheric density is largely independent of the solar cycle (see Fig. 8-11), and the upper and lower curves for each coefficient begin to merge. From there to lifetimes of about half a solar cycle (approximately 5 years) there will be a very strong difference between satellites launched at the start of solar minimum (upper curve) and those launched at the start of solar maximum (lower curve). Also note that the difference between the solar maximum and solar minimum curves is larger for satellites with a lower ballistic coefficient as we would expect. (Balloons respond to drag more than bowling balls do.) After about half a solar cycle, satellites on the upper curve of each pair will hit solar maximum and the curve will become much flatter. In contrast, those on the lower curve will hit solar minimum and will nearly stop decaying such that the curve becomes nearly vertical. This oscillatory pattern continues with a frequency of the 11-year solar cycle as can be seen in the upper portion of the curves. Finally at high altitudes and long lifetimes the curves come together because the satellite will see a large number of solar cycles and it will make very little difference when the satellite starts, of course the actual lifetime for any particular satellite will depend on both the actual F10.7 index variations and the design and attitude history of the satellite. Nonetheless, Fig. 8-13 provides an estimate of the extrema for use in mission design and can be used to estimate the lifetime for a specific satellite if the ballistic coefficient and launch date relative to the solar cycle are know. where pN is the number density of atomic oxygen (see Fig. 8-5), and V is the satellite velocity. (See tables on inside rear cover.) In addition, chemical reactions involving atomic oxygen may produce radiatively active, excited constituents which, in turn, emit significant amounts of background radiation, create effects such as "Shutde glow," and interfere with optical sensors. Atomic oxygen forms when solar ultraviolet radiation dissociates molecular oxygen. Above 110 km, atmospheric constituents diffuse, and each constituent's density varies with altitude according to its scale height. 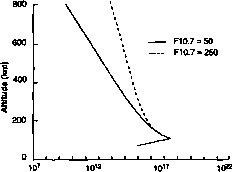 The scale height of a constituent is the height change over which the density drops to 1/e of its value. In diffusive equilibrium, the scale height is inversely proportional to its molecular weight Thus, the density of light constituents decreases less rapidly with altitude than the density of heavy constituents, and eventually the light constituents dominate the mixture of gases. Atomic oxygen is lighter than the molecular nitrogen and oxygen; therefore, near -170 km altitude, atomic oxygen becomes the most abundant constituent. Fig. 8-5. 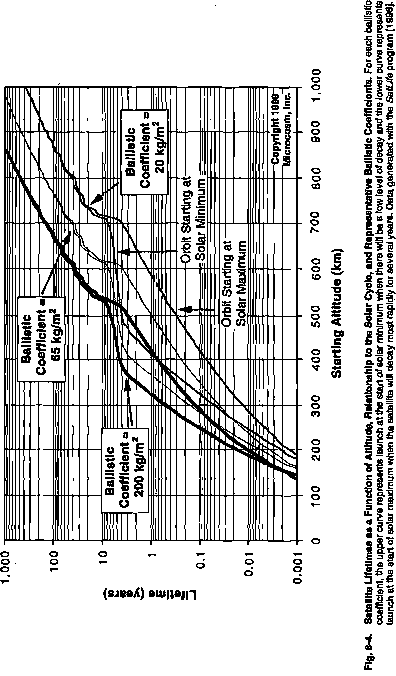 Altitude Profiles of Number Density of Atomic Oxygen at Solar Minimum (Solid Line) and Solar Maximum (Dashed Line). Figure 8-5 shows altitude profiles of atomic oxygen number density over the equator for F10.7 values of 50 and 250. These values represent the extremes for solar minimum and maximum, respectively. The profiles are based on predictions from the MSIS model [Hedin, 1986] for 3 p.m. local time at northern hemisphere equinox and for geomagnetically quiet conditions [Walterscheid, 1989]. Up to 150 km, the solar-cycle variation is small, but it increases steadily with increasing altitude. By 300 km, the number density of atomic oxygen at solar maximum becomes an order of magnitude greater than at solar minimum. The large solar-cycle variation in atomic oxygen means spacecraft materials can be selected based on phasing the mission to the solar cycle. Since there are large differences between solar cycles, material choices made on the basis of average solar maximum conditions may be inappropriate because of the possibility of more extreme solar maximum conditions. where B is the local magnetic field intensity, A is the magnetic latitude, R is the radial distance measured in Earth radii (RE), and Bq is the magnetic field at the equator at the Earth's surface [B0 = B(R = RE, A = 0) = 0.30 gauss]. As shown in Fig. 8-6, the interaction between the solar wind and the Earth's magnetic field causes magnetic field on the night side of the Earth to stretch into a very elongated structure known as the magnetotcdl (see Tsyganenko  for a more complete model of the Earth's magnetic field). A thin plasma sheet bifurcates the magnetotail, which extends over 1,000 Earth radii parallel to the flow velocity of the solar wind. Fig. 8-6. 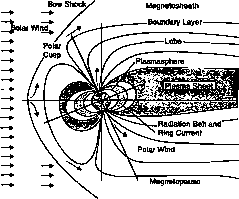 A Cross Section of the Earth's Magnetosphere. It shows the key plasma and energetic particle populations which respond to variations in solar wind parameters. Through the interaction between the solar wind and the Earth's magnetic'field, some of the solar wind's kinetic energy is converted to magnetic energy stored in the magnetotail. Because this energy cannot build up indefinitely, magnetic substorms dissipate it from time to time. These substorms produce an energized plasma (S to 50 keV) that is injected toward the Earth. This hot plasma can extend into geosynchronous orbits, charging the surface of any spacecraft within it to high negative voltages. The electrical potential of a spacecraft or component is measured with respect to the plasma in which it is immersed where the net current flow is zero. That is, the following currents must cancel each other (1) the electron current from the plasma to the vehicle, (2) the ion current from the plasma to the vehicle, (3) the secondary election current, (4) the backscattered electron current, and (5) the photoelectron current. The voltage at the component's surface also depends on the material's capacitance with respect to the surrounding materials, especially the vehicle ground. Because materials have varying secondary emission coefficients and photoelectron currents, their equilibrium potentials also differ. An electrostatic arc occurs if the electric field exceeds the breakdown field along the surface of the material, through the material, or between adjacent materials. Electromagnetic interference, EMI, from such arcs can cause spacecraft to operate erratically [Robinson, 1989]. Surface charging detrimental to vehicle operation occurs mainly in orbits where electrons with energies of 10 to 20 keV dominate the electron cunent from the plasma to the vehicle. At low altitudes this charging occurs only at high latitudes where auroral electrons collide with the vehicle which is passing through an otherwise cold, low-density plasma [Gussenhoven et al., 1985]. For other low-altitude locations, low-energy electrons usually develop enough current to keep electric fields below breakdown levels. In higher orbits, such as geosynchronous, surface charging occurs during mag-netospheric substorms between the longitudes corresponding to midnight and dawn [Fennell et al., 1983], We can approximate the electron-flux distribution during a substorm by summing a cold and a hot Maxwellian distribution. The cold component has a density of 0.2 cmr3 and a temperature of 0.4 keV; the hot component has a density of about 23 cm-3 and a temperature of 25 keV [Mullen et al., 1981]. We must design spacecraft which either keep the differential charging caused by this plasma well below breakdown potentials, or can tolerate the resulting electrostatic discharges. Design guidelines are available to help reduce differential potentials on vehicle surfaces [Purvis et al., 1984; Vampola et al., 1985]. For example, we can select candidate materials and conductive coatings, apply numerical or analytical models using their quantifiable characteristics, and determine their differential potentials in space. If we cannot prevent discharges by selecting alternative materials, we might consider alternatives such as special filtering, cabling, or grounding. We can employ coupling models for electromagnetic interference simulation, and test the vehicle for electrostatic discharges in its flight configuration. It is important to note that while differential charging as discussed in the preceding paragraphs is not seen in lower equatorial orbits, the spacecraft potential may be as much as 90% of the solar array voltage more negative than that of the surrounding plasma depending on the configuration of the spacecraft electrical power supply. This may be a concern on scientific missions, where nonbiased measurements of the plasma environment are desired, and may also give rise to arcing or other undesirable effects if high voltage power supplies are used [Tribble, 1995]. The Van Allen radiation belts are a permanent hazard to orbiting spacecraft They consist of electrons and ions (mostly protons) having energies greater than 30 keV and are distributed nonuniformly within the magnetospheie. As illustrated in Fig. 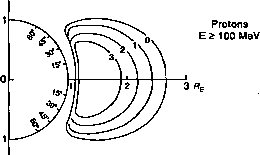 8-7, the energetic electrons preferentially populate a pair of toroidal regions centered on the magnetic shells L - 13 (inner zone) and L - 5 (outer zone). 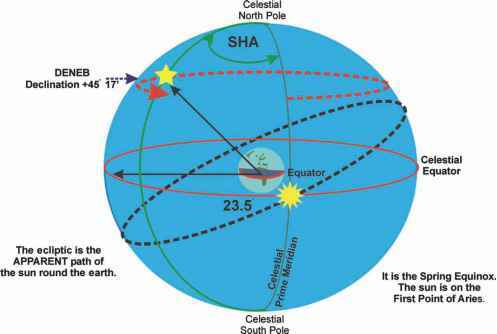 where R is the distance in Earth radii from the idealized point dipole near the Earth's center, and A is the magnetic latitude. Thus, the L value of a dipolar magnetic shell is its equatorial radius measured in Earth radii. 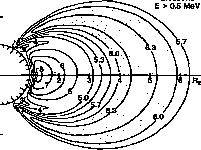 A generalized concept of £, introduced by McHwain , takes account of the way higher harmonics of the main geomagnetic field perturb the motion of charged particles from their dipolar trajectories. Normally, we use this concept instead of the dipole L value for mapping the trapped radiation environment Standard models of the Van Allen belts are available from the National Space Science Data Center. 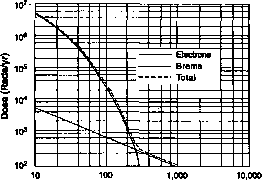 The model which provides inner zone (L = 1.2 - 2.4) electron data is AE8, which has an average energy range of 40 keV to 5 MeV [Bilitza et al., 1988]. AE8 has two forms, AE8MIN and AE8MAX, which represent the time-averaged environments during solar minimnm and maximum. Outer-zone electron fluxes vary much more over time than inner-zone fluxes. Indeed, during a major magnetic storm, the equatorial intensity at a given energy and L value may grow by several orders of magnitude (factors of 10) in less than a day. Between storms, such flux enhancements usually decay exponentially with an energy-dependent lifetime x ~ 10 E(MeV) days at L > 3. Available proton models are AP8MIN and AP8MAX, which also represent die solar minimum and maximum periods. At solar maximum, the increased atmospheric densities decrease the proton fluxes because the trapped protons collide with the atmosphere at low altitudes. The AP8 models cover the energy range from 100 keV to > 400 MeV. Figure 8-8 shows some of AP8MlN's typical contours for proton fluxes in (R, X) space. Since the M1N model predicts slightly more flux than the MAX model, it can be used during solar maximum or as a conservative model for long-term missions. Fig. 8-8. High-Energy Protons In the Inner Zone. Axes and unite are the same as on Fig. 8-7. (Note a somewhat different scale.) Data Is the omnidirectional flux from the AP8MIN model. Only protons with energies above 100 MeV are considered. Fig. 8-9. Radiation Dose Rates as a Function of Altitude for Low-Altitude Polar Orbits. 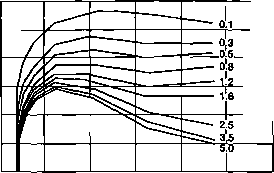 Dose rates are shown for several shielding depths. field more than 10-15 years into the future, our calculations will be invalid for low-altitude orbits [Konradi and Hardy, 1987]. The present and future configurations of the inner-zone proton belt probably will not differ much, provided both are described in terms of L and A. We can determine the appropriate amount of shielding for future spacecraft by computing the dose rate for die desired orbit as a function of shield thickness. To do so, we must apply a radiation transport computation to the time-averaged space environment. Figure 8-9 shows how various shielding depths affect radiation doses in low-altitude polar orbits. 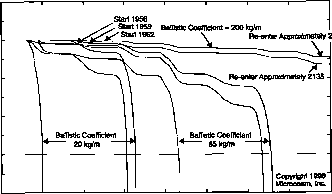 Figure 8-10 shows results for geosynchronous satellites. A rod is that amount of radiation which deposits 100 ergs (= 6.25 x 107 MeV) per gram of target material (100 mils of aluminum is equivalent to 0.686 g/cm2). The total radiation dose consists of three components: proton dose, electron dose, and bremsstrahlung X-ray dose produced by the interaction of electrons with the shielding material. In low-Earth orbits, energetic protons in the inner radiation belt contribute most to the total radiation dose. Radiation dose strongly depends on altitude; below 1,000 km the dose increases at approximately the 5th power of the altitude. At synchronous altitude the greater than 5 MeV proton dose is negligible and the bremsstrahlung dose dominates the electron dose for shield thicknesses greater than 1 cm. Figure 8-10 illustrates that protons trapped near a geosynchronous orbit do not have enough energy to penetrate 10 mils of aluminum. Nevertheless, many trapped protons and heavier ions in this region of space have energies around 10-200 keV. These lower-energy ions can harm space systems differently than penetrating radiation. By depositing their energy in the spacecraft skin, the lower-energy ions can cause a temperature rise sufficient to significantly enhance the infrared background. Heat loads of up to 0.5 W/m2 are possible. These same low-energy ions can degrade the effectiveness of paints and protective glass by breaking chemical bonds in their surface layers. We cannot shield against these effects. Fig. 8-10. Radiation Dose Rate In Geosynchronous Equatorial Orbit for Various Shield Thicknesses. Solar particle events (SPEs) occur in association with solar flares. SPEs are rapid increases in the flux of energetic particles (~ 1 MeV to above 1 GeV) lasting from several hours to several days. On the average, only a few SPEs occur per year; however, they have important consequences for man-made systems and for man in space. For example, they degrade solar array elements, increase background noise in many types of electro-optical sensors, and cause illnesses in astronauts. Figure 8-11 shows the typical evolution over time of a solar particle event observed near Earth. The profile depends on the time evolution of die originating solar flare, how long the energetic particles take to diffuse within the solar corona and how the particles propagate within the interplanetary medium. Protons of relativistic energies arrive at Earth within minutes after the flare's occurrence. Lower energy (~10's of MeV) protons are slowed by diffusion within the solar corona and by interactions with the interplanetary medium. After a solar particle event occurs, proton fluxes decay to background noise values over several days. The practical importance of an individual event depends on its maximum intensity, its duration, and the relative abundance of the highest-energy components and heavy nuclei. The frequency of proton events peaks within a year or two of sunspot maximum and diminishes greatly during the few years surrounding sunspot minimum. Nevertheless, intense events can occur virtually any time within the 11-year sunspot cycle except at sunspot minimum. Table 8-4 shows when the most and fewest sun spots will occur for solar cycles 21-25. The intensities of typical solar proton events closely follow a log-normal distribution [Jursa, 1985; King, 1974; Feynman et al., 1988]; thus, a few individual events can dominate the total proton fluence observed over a complete solar cycle. Table 8-5 shows the parameters of this distribution. For example, using the values in Table 8-5, a typical solar proton event has a fluence above 10 MeV of 108-27 cmr2, whereas an extreme (3o) event would contribute 10<8-27 + 3x0.59)cnr-2 = i.i x iQtOcnr2. Fig. 8-11. Typical Time Evolution of a Solar Particle Event Observed on Earth. TABLE 8-4. Years of Sunspot Maxima and Minima tor Solar Cycles 21 -25.